Make sure the berberine or goldenseal supplement you take passed our test and is right for you! Berberine is a compound found in goldenseal root that may help control blood sugar levels and cholesterol levels, and, potentially may aid in treating certain heart conditions. It is available as a supplement, usually as berberine HCl, or from goldenseal root powders or extracts -- although these typically contain just a fraction of the berberine that's in berberine supplements. Finding the best quality berberine or goldenseal products was a challenge because many products on the market don't provide the amounts listed on their labels. 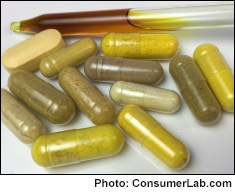 ConsumerLab.com purchased and tested a range of popular berberine and goldenseal supplements. What did we find? Most goldenseal supplements do not contain their minimum expected amounts of berberine. In fact, one did not contain any detectable berberine despite bearing multiple seals of quality on its label. Even among berberine supplements one was found to provide only 78% of its listed amount of berberine. Fortunately, we did find a few products that contained what they should and were properly labeled. Among these, we identified those that provide the best value — making them our Top Picks. You must be a ConsumerLab.com member to get the full test results along with ConsumerLab.com's Top Picks. You'll get results for 13 supplements: 10 selected by ConsumerLab.com and three that passed the same testing in our voluntary Quality Certification Program. Which supplements passed or failed testing - and an easy way to tell which are fake!